This guide is intended to provide a comprehensive description of the encounter with Oregorger in Blackrock Foundry. It is targeted at anyone who desires to understand the fight mechanics. Oregorger is one of the bosses in the Slagworks wing of the Blackrock Foundry instance. This single target, two-phase fight will mostly strain your raid's ability to move and to employ correct positioning. This main part of this guide covers both the Normal and Heroic versions of the encounter, as far as mechanics and general strategy is concerned. The only difference between these two modes is found in the tuning, with Heroic being more difficult. When we speak of extreme situations (such as the difficulty of a soft enrage timer, or damage from a certain source being too high to survive), we mostly refer to Heroic mode. In addition to this, we have a specific Mythic mode section, where we present all the differences between Normal/Heroic and Mythic, as well as the strategy to defeat the Mythic encounter. We do not currently know what the hard enrage timer for this encounter is. There do not seem to be any soft enrage mechanics in the fight. In this section, we will very briefly summarise what the players belonging to each of the three roles have to do during this fight. This is by no means meant to provide sufficient information to master the encounter, and it is only supposed to give you a very rough idea of what to watch out for. Perform a tank switch on the boss for each Acid Torrent cast. The tank currently tanking Oregorger must make sure that they are the closest player to the boss. When Acid Torrent is cast, consider using a damage-reduction cooldown. Make sure that the tank who is being hit by Acid Torrent has some damage mitigation cooldown active, or otherwise be prepared for high raid-wide damage. Heal the raid-wide damage from Acid Torrent, as well as occasional damage from Retched Blackrock, Explosive Shard, and Blackrock Barrage. During Phase Two, heal the regular, increasing raid-wide damage, and make sure not to lose line of sight to other raid members. During Phase One, DPS Oregorger. During Phase Two, DPS and quickly kill Ore Crates. Interrupt as many casts of Blackrock Barrage as possible. Avoid the Retched Blackrock void zones (ranged) and the Explosive Shards (melee). Avoid being hit by Oregorger. Do not lose line of sight to the healers. In Mythic mode, avoid the fire walls during Phase Two. The encounter against Oregorger is a single target, two-phase fight. Oregorger has a Mana resource, which determines when the phase changes occur. He begins with full Mana, in Phase One, and each one of his abilities costs some Mana. When he runs out of Mana, he enters Phase Two, during which he rolls around the floor of the room, collecting Blackrock Ore to refill his Mana. When Oregorger has refilled his Mana, he goes back into Phase One, and so on until the end of the fight. Throughout Phase Two, raid members will have to destroy crates containing Blackrock Ore in order to ensure that Oregorger has enough ore to collect and refill his Mana pool. We have released a video preview of the encounter against Oregorger, based on our (Heroic) Beta testing. You can watch this video to get a good idea of how the fight works, but keep in mind that some things can still change before the fight goes live. You engage Oregorger in a rather large room, which is shaped much like a maze. Large rocks are scattered all over the floor, creating a network of corridors, and blocking line of sight. During Phase One, as we will see, the layout of the room does not play an important role at all, but during Phase Two, it is very important. In this second phase, the boss will regularly roll through these corridors at great speed, and your raid members will have to avoid the boss as much as possible. Phase One lasts until Oregorger runs out of Mana, at which point he enters Phase Two. Most of Oregorger's abilities cost Mana, but, as we will see, there is one interruptible ability that only consumes Oregorger's Mana if the cast is successful. Acid Maw is a stacking Nature damage DoT that Oregorger applies to his tank. This ability requires a tank switch. Acid Torrent is an ability that Oregorger uses regularly throughout Phase One. He targets a random ranged raid member, and shoots a cone attack in their direction. This attack deals a massive amount of Physical damage to the closest player to Oregorger, but it does not damage anyone else (including the targeted player). However, the entire raid takes Nature damage as soon as the closest player is hit by Physical damage; the amount of raid-wide Nature damage is, by default, very high, but it is reduced by the total damage mitigation of the closest player (the player who was hit by the Physical damage). The closest player will also be debuffed to take increased damage from Acid Torrent for 20 seconds. Retched Blackrock is a damaging void zone that Oregorger regularly places at the location of random raid members (mostly ranged players). These void zones deal Nature damage, and they persist for a relatively long time. Explosive Shard is an ability that Oregorger uses regularly throughout Phase One. He throws an explosive shard at the location of a random raid member (he seems to prefer melee players), which deals a high amount of Physical damage to any players in a small radius, knocking them back. 3 seconds after this, the shard explodes, dealing a high amount of Fire damage to any players around it, also stunning them. Blackrock Barrage is an interruptible spell that Oregorger often casts throughout Phase One. It deals a high amount of raid-wide Physical damage. Every successful cast of this ability consumes some of Oregorger's Mana, but interrupted casts do not. Blackrock Barrage is cas in salves of 3, followed by a long pause. This is indicated by a buff that Oregorger receives, which starts out with 3 stacks, and which loses a stack with each cast of Blackrock Barrage (whether successful or interrupted). The strategy for Phase One is, generally speaking, to interrupt as many casts of Blackrock Barrage as possible, while dealing with the rest of Oregorger's abilities. Doing so will prolong the amount of time the boss spends in Phase One (and reduces raid damage taken), which is arguably easier than Phase Two. In the sub-sections that follow, we will go into detail about each of the tasks that the raid has to perform. There are two abilities that concern the tanks, namely Acid Maw and Acid Torrent. Acid Maw is easily handled through a simple tank switch, and as you handle Acid Torrent, this will happen on its own. Your ranged raid members should stack together some distance away from the boss, while your melee players should be loosely spread out around the boss. The ranged group will have to consistently move out of the Retched Blackrock void zones that the boss will throw at them. It is important that these void zones be placed as close to each other as possible, in order to conserve space (which is needed greatly, especially during Phase Two). As such, the ranged group should always be stacked together at the edge of the existing void zones, so that the void zones can even overlap. On the Beta, having all ranged raid members in one single group was not a strict requirement, since the frequency of Retched Blackrock void zones was not very high. As such, it was possible to have ranged players spread out in two groups, or even have them loosely spread out individually, but we still advise stacking into a single group. Melee players will have to keep a constant eye out for casts of Explosive Shard, and when a shard is dropped, they need to make sure not to be in its close proximity when it detonates (3 seconds after landing). Moreover, melee players must make sure not to be in front of the boss when Acid Torrent is being cast, since it is important that the tank be hit by this ability instead. Interrupting as many casts as possible of Blackrock Barrage is very important. Depending on your raid size and composition, you may not be able to interrupt every cast, but you should still try. Each cast that you fail to interrupt will cause an amount of raid damage, and, more importantly, will reduce the amount of time that Oregorger spends in Phase One. Since Blackrock Barrage is typically cast 3 times in quick succession, followed by a longer break, assigning a rotation of 3 players (with a few backups), is recommended. Throughout this phase, healers will have to mostly watch out for the raid (and tank) damage caused by Acid Torrent. For this purpose, using external damage reduction cooldowns on the tank who will be affected by Acid Torrent is an important part of the fight. There will be additional raid damage caused by players who do not immediately move out of Retched Blackrock void zones, as well as both avoidable and unavoidable raid damage caused by Explosive Shard, but these damage sources should not require extraordinary amounts of healing. Phase Two begins as soon as Oregorger runs out of Mana. The boss can no longer be tanked (and he does not melee anymore), and instead he simply rolls around through the room at high speed. As he does so, he collects any blackrock ore that he comes in contact with, and the phase ends when Oregorger has collected enough ore to refill his Mana. The ore is located in a number of Ore Crates that spawn at the start of each Phase Two, which are scattered around the room. Attacking and killing these completely harmless and stationary crates reveals the blackrock ore that Oregorger can then collect. When Oregorger reaches full Mana, Phase One restarts. Rolling Fury causes Oregorger to roll around the floor, dealing a very high amount of Physical damage to any players he comes in contact with, knocking them down. Earthshaking Collision causes Oregorger to deal a small amount of raid-wide Nature damage each time he comes to the end of one of his rolls. Hunger Drive is a stacking buff that increases the damage that Oregorger's Earthshaking Collision deals by 5% per stack. Throughout this phase, your raid will regularly take damage from Earthshaking Collision. This damage will ramp up as the boss gains more and more stacks of Hunger Drive, so it is in the raid's best interests to end the phase as quickly as possible. For this reason, DPS players should destroy as many Ore Crates as possible, as quickly as possible. Throughout the phase, avoiding Oregorger as he rolls around is of paramount importance. Doing so is not very easy, however, because there does not appear to be any pattern to his movement. That said, Oregorger faces the direction in which he is going to roll before he does so, and it is also worth knowing that he will never roll back the way he came. This should allow players to get out of the way quickly enough. Players should be mindful of their positioning, since it is easy to lose line of sight to the healers while running around and trying to kill Ore Crates. The healers should be spread out throughout the room so that they can reach most raid members easily. We recommend using Heroism/ Bloodlust/ Time Warp at the start of the encounter, since this is when all players will have their DPS cooldowns available, and especially because there are no other, more suitable moments during the encounter. The Mythic mode of the Oregorger encounter is very similar to the Normal/Heroic mode in terms of strategy, and this will probably be one of the first encounters your raid attempts on Mythic mode. As with all Mythic encounters, the boss has more health and deals more damage than in Normal/Heroic mode. In addition to this, there is a change to one Phase One ability, and a new ability in Phase Two. 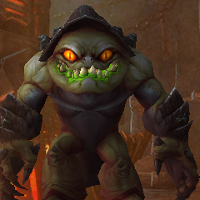 During Phase One, Oregorger casts a salve of 5 Blackrock Barrages, up from 3 in Normal/Heroic mode. During Phase Two, whenever Oregorger comes to the end of a roll, he creates a small mound of smoldering earth at that location, called Unstable Slag. This does nothing, but if Oregorger ends another roll at a location where there is already an Unstable Slag, there will be an Unstable Slag Explosion. This ignites the Unstable Slag, destroying it, and causing waves of fire to spawn from it. The number of fire waves depends on how many corridors of the maze there are around the Unstable Slag; there is always one fire wave per corridor. The waves travel along through the maze, dealing a high amount of Fire damage to any players they hit. They only travel in a straight line, and they disappear when they reach the first wall (so, they do not turn at corners). If the waves come in contact with another Unstable Slag, they ignite it, causing it to also spawn fire waves (and destroying it in the process). Your raid has absolutely no control over the boss' rolls or over anything related to the Unstable Slag. Since the Unstable Slag Explosions will typically ignite other Unstable Slag, and since the boss will create a new Unstable Slag each time he finishes a roll, there will be a constant stream of Fire waves throughout this phase. The strategy for the encounter against Oregorger in Mythic mode is extremely similar to the Normal/Heroic mode strategy. Throughout Phase One, the raid will execute exactly the same strategy as in Normal/Heroic mode. The only change is that you will have to interrupt 5 casts of Blackrock Barrage in quick succession, up from 3. This means you will have to assign more interrupters to it, but it is possible to survive the damage even if a few Barrages go through. Throughout Phase Two, the raid will also execute the same strategy as in Normal/Heroic mode, with the added difficulty of avoiding the walls of fire created by Unstable Slag Explosion. There is not much to be said about how to avoid them except that you should move out of their path (which is possible because, as we stated, they do not move around corners). One note regarding Phase Two is that, in order to make up for the increased Mythic mode damage, it might be a good idea for the raid to stick together (and to kill the Ore Crates as a group). This will make healing easier, and it should reduce the line of sight issues to a minimum. Your raid's success or failure in this encounter will depend on your efficiency during Phase Two. If many players get hit by Oregorger's rolling during Phase Two, or if the raid fails to destroy enough Ore Crates in time (before the raid damage overwhelms the healers), then this phase will lead to deaths. Therefore, it is important to stress proper efficiency in Phase Two, and to ensure that players are always mindful of their position as far as line of sight to the healers is concerned. During Phase One, the area in which you have the most room for improvement (or for mistakes) is interrupting Blackrock Barrage, so setting up an efficient interrupt rotation is very important. In this section, you will find the loot table for Oregorger. The section is divided in 3 subsections: armor, weapons, and the rest (neck, back, finger, and trinket items). This concludes our raid guide for Oregorger. We hope you have found it helpful. Please do not hesitate to post any feedback you may have on our forums. 10 Feb. 2015: Added Mythic mode strategy. 04 Feb. 2015: Made some updates to the guide, especially regarding the explanation of Acid Torrent.